Mother Nature has been experimenting on her own designs for eons and many are looking to capture insights from evolution. Biologically inspired design (BID), which is a process of translating biological mechanisms to innovative solutions, is gaining a lot of traction for research and development. Some are turning to biology as a source of innovation; others are trying to improve the sustainability of products and services. Whatever the pursuit, many BID projects go no further than the “inspiration phase”- scientists and designers struggle with turning the “cool idea” into an actual product or service. Clearly identifying the best potential solutions, determining the critical aspects of the biological “solution”, finding the necessary biological knowledge, and understanding how to transfer it to the benchtop are some of the challenges. What can you do to avoid the proverbial “valley of death” in research and development? We recently partnered with a top three personal care products company to help them bridge this gap and get them to the next phase of innovation research quickly and purposefully. It’s important to start in the right place-biology solves some problems and not others. PatternFox uses two internally developed tools to make sure we are asking the right question before we start seeking an answer. Functional decompositions start with the desired goal and links this to key processes and functions within the system of the product. This breaks the overall goal into a series of necessary sub-functions that are potential targets for biological solutions. Key questions we ask include “Why do we want this function” and “How is this function currently addressed”. Functional decompositions also act as a map linking reinforcing and opposing functions within the system. Working with the company, the visual problem map of WHY and HOW the desired functions are interconnected led us to understand better the trade-offs and recognize some limitations with current design. For example, mechanisms by which liquid can be retained often limit distribution. 4-box Models take a deeper look into the problem using four dimensions; operational environment, function, specifications/materials and performance criteria. These are used to help narrow the search field to those mechanisms that perform similar functions under similar circumstances. A healthy serving of literature search is on the menu when pursuing biology for inspiration; failure to properly identify the problem can prevent inspiration from becoming innovation. Our problem definition tools provide insight into the “right” keywords for searching. Understanding the evolutionary process also is key. This helps us to search with sufficient breadth and depth to find the best solutions. Once potential solutions are discovered, moving forward requires understanding general patterns. Organisms with promising functions are grouped into design principles. For example, many biological solutions for fluid transport can be related to La Place pressure, whereas others relate to temperature gradients. Variations within each general pattern represented by different organisms helps reveal how to fine tune a solution for a specific problem. We researched more than 150 organisms in our work with the company that were organized into roughly 10 design patterns. How do you take that many organisms and make a decision on what’s worth a deeper look? Pursuing unpromising designs increases time to innovation and can derail the entire process. PatternFox mapped each potential solution back to the original problem by scoring each organism based on how well it fit the problem. We then took the top scoring organisms and developed a mathematical model of the proposed design concept to test the theoretical conditions of the system based on what we know of the design inputs. This back of the envelop calculation reveals which potential solutions clearly cannot work given the problem constraints. 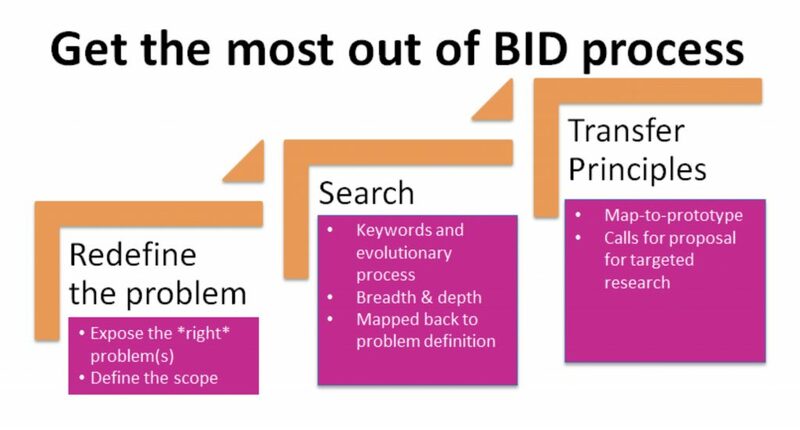 The final place where the BID process can fail is at the prototype stage of concept testing. Existing biological research may not be deep enough to extract all the design specifics – that is, the engineering “levers” employed by the organism to achieve a function in a given context. For example, “Geckos stick to walls with Van der Waals forces ” does not tell us anything about how to make something that will stick to a particular surface for a particular task. More detailed information is required. PatternFox was able to provide a map-to-prototype that is how much we actually know about the mechanism we are trying to replicate, and what are the critical gaps. Each most promising organism was evaluated on a spectrum from “Basic” to “Targeted” understanding of the underlying mechanisms each organism used. We then helped the company develop calls for proposals to dig deeper into each organism and uncover the design principles that will lead to “Prototype” level of understanding; actionable items which opened two new lines of research into the understating of biological mechanisms. Click here <http://bit.ly/2jVN38q> to listen in on the hour-long discussion with PatternFox, Kimberly-Clark, and IRI.